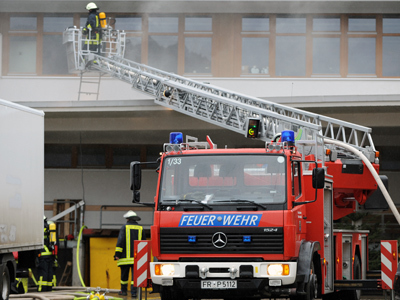 Fourteen people have died in a fire at a workshop for disabled people in Titisee-Neustadt, Germany. At least six others were seriously injured. Firefighters, police, and helicopters responded at the scene. "We have a large number of injured who have been taken to hospital," Karl-Heinz Schmid, a spokesman for police in the nearby city of Freiburg, told N24 news. He added that it was too early to tell how serious the injuries were. Some 100 firefighters arrived to battle the fire. Smoke was billowing out of the building more than an hour after the fire began. The blaze broke out at 2pm local time, after an explosion in the storage room of a warehouse processing timber. Around 50 staff members present when the fire started. Many were rescued by firefighters wearing breathing appartatus. Around 120 people with intellectual or multiple disabilities work at the center. It provides employment in metal and wood processing and electrical assembly. It remains unclear whether chemicals were kept in the storage room, and the exact cause of the fire is not yet known. The center, which is run by the Catholic Church’s Caritas organization, was developed 30 years ago and renovated in 2002.